In addition to the Texas mountain laurel that we saw at the Mueller prairie restoration on February 17th, there was a particularly picturesque yaupon, Ilex vomitoria, that bore lots of fruit. It was The Lady Eve* who took this photograph of it, in which she contrasted the tiny red drupes of the tree with the similarly colored but much larger metallic sculpture beyond it. 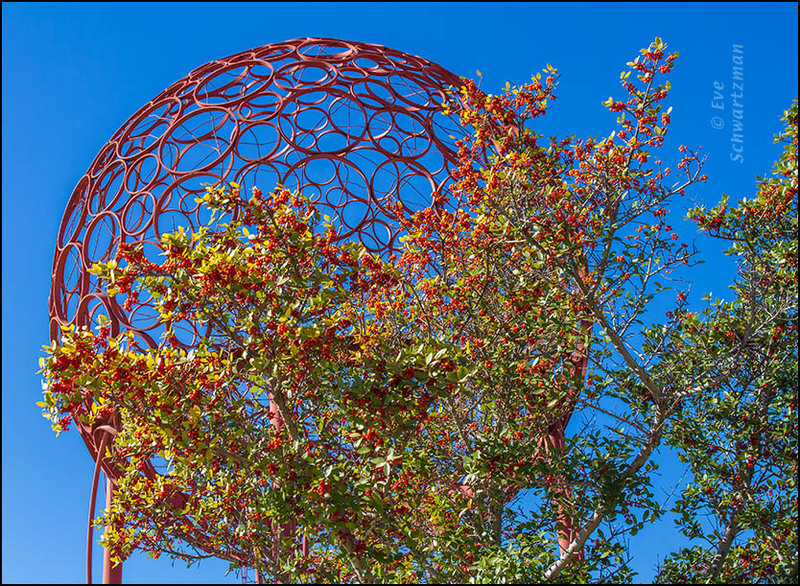 Chris Levack‘s sphere, which has a diameter of 14 ft. (4.3 m) and represents a grain of cactus pollen, is appropriately named Pollen Grain; the work was erected in 2008. The Lady Eve also happens to be the name of an excellent 1941 comedy directed by Preston Sturges and starring Barbara Stanwyck and Henry Fonda. Here, too, Indian tribes used to drink a tea made from yaupon; it was a part of their religious ceremonies. Coincidentally, we were at a Whole Foods store yesterday and bought some plátano chips that had been imported from Ecuador. They made us feel good, not queasy. how great! yes, you should be able to find the ‘green’ ones and the ripe ones. the ripe ones have a nice sweetness to them, and i often buy those when on the run and need something to hold me until i can eat. the chips are usually just plantains and oil – such a refreshing change from artificially -‘enhanced’ flavors that are so bad for one’s health! fried yucca chips are nice too.. they’re sometimes much thinner than plantains and make a good potato substitute. These weren’t sweet, unlike most of the ones I’ve bought in the United States. As you say, the only ingredients were bananas, oil, and salt. I don’t think I’ve had yucca chips here, but fresh yucca is available at Asian and Latin American groceries here. From time to time I’ve bought some and boiled it to serve as a potato-like vegetable. I learned to eat both plantains and yucca (as well as tortillas) in the two years that I spent in Honduras. there’s a company here that makes not only fried yucca chips, but also fried beet chips and white parsnip chips! that brand is expensive, though the beet chips are unique. Too bad you can’t put some of those into a comment and send them to me. Que disfrutes (dislegumbres? disraíces?) de la cabalgada de tres horas, pero que no seas mendiga. The sculpture made me laugh – a pollen grain?! It’s a neat sculpture and a great photo, especially with the illusion of the sculpture being held in the branches of the tree. It evokes another such installation, the 1964 World’s Fair Unisphere. It’s good of you to point out the happy illusion of the tree holding the sphere. Welcome, retroactively, to my extended neighborhood from childhood. I can see where a bunch of kids from Iowa might have had as good a time with the Pennsylvania Turnpike and Howard Johnson’s as with the Word’s Fair. I remember, when I dragged a class of algebra students to an art museum in San Antonio in around 1982, that one of the kids seemed more enchanted with the museum’s glass-walled elevators than with its works of art. My dad had some of those stamps in his collection, too. I still have a portion of the collection. I’ll have to look and see if those are included. Good luck finding them, and your long-lost bracelet as well. Interesting photo. I rather like it. But a pollen of grain or was that grain pollen? My yaupon is still covered in berries. The birds much prefer the Possum Haw holly. Glad you like it. In answer to your question, the sculpture is neither a pollen of grain nor grain pollen, but Pollen Grain, i.e. a grain of (cactus) pollen. It is though, an interesting photo despite the subjects name, not the plant. Beautiful. This gives pollen a good name, for a change, says the allergy sufferer. We can only wish that real pollen were as harmless to us allergy sufferers as this giant red one.